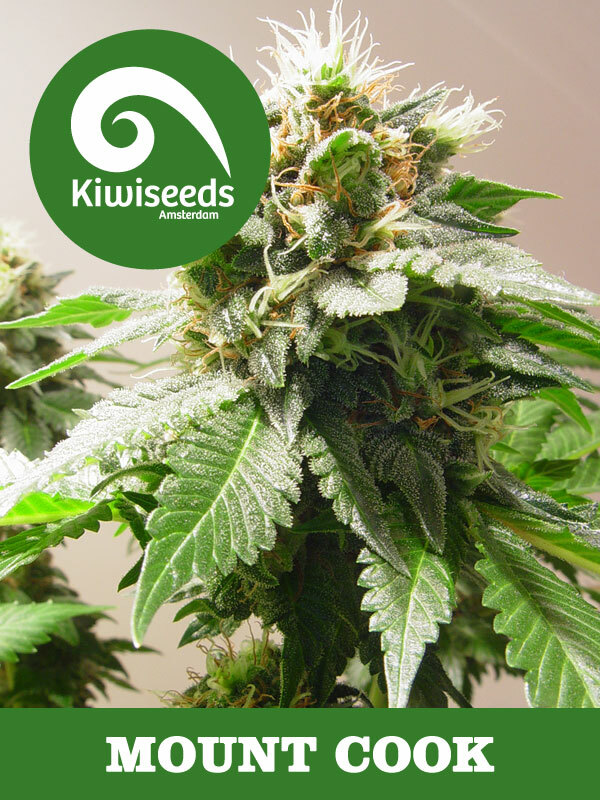 1st prize - best Indica strain - H.T Cannabis Cup - 2008 Mt Cook, (or Aoraki as it’s known in Maori) is the highest and most majestic mountain in N.Z and Kiwiseeds have done their best to produce a plant that lives up to its name! Mt Cook is a mainly indica hybrid of 2 very special plants. The mother is of Afghani/Thai roots and was selected from 100’s of females in a Kiwiseeds breeding program carried out in N.Z in 1998. She was picked for her short flowering times, THC content, and compact structure as well as fruity taste and aroma influenced by the Thai genetics. The resulting plant was brought back to Holland in clone form, and after much trial and error crossing her with various males, eventually a suitable pollen donor was found. This came in the form of one ‘Northern Lights’ X ‘Hashplant’ used in a previous hybrid from Kiwiseeds called ‘Milky Way’. ‘Mt Cook’ comes with all those familiar indica characteristics. Lovely deep-green leaves, short thick, stems and branches, fat pungent buds simply coated in snow-like crystals. The smoke is heavy and stony, almost paralyzing! Although a little longer than some Indicas, Mt Cook has a reasonable flowering time, and good yield making it a great indoor plant.